The stock fuel pump should be adequate, but it should be capable of meeting NEW pump specs. If unsure, replace. Use only premium grade pump gasoline (92+ octane) or unleaded racing fuel. In many instances, a high-output ignition system and a free-flowing exhaust system may benefit performance. WARNING: DO NOT use aftermarket chips or other devices that advance ignition timing, as detonation may occur. Actual performance gains will vary depending on the engine’s condition and configuration. 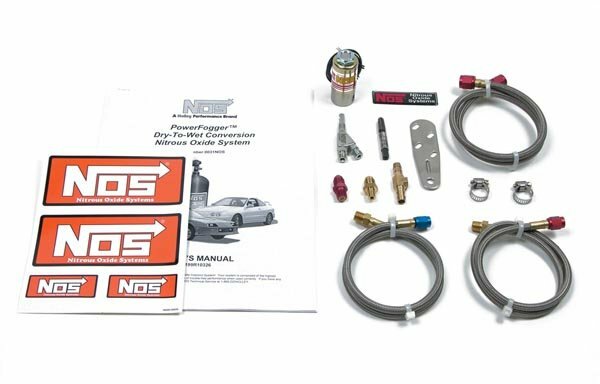 This simple kit allows users to convert their existing "Dry" kit to hard hitting "Wet" nitrous. Thousands of existing "Dry" kit users can now have "Wet" nitrous without buying another complete kit.